Double-click an event calendar name in the Calendar List. Right-click an event calendar in the Calendar List and select the Calendar Properties command. Click the Calendar Properties command in the Edit menu, or press the F2 keyboard shortcut. The Properties of the currently active calendar will be shown. Each calendar of the Calendar List can have its properties individually modified. 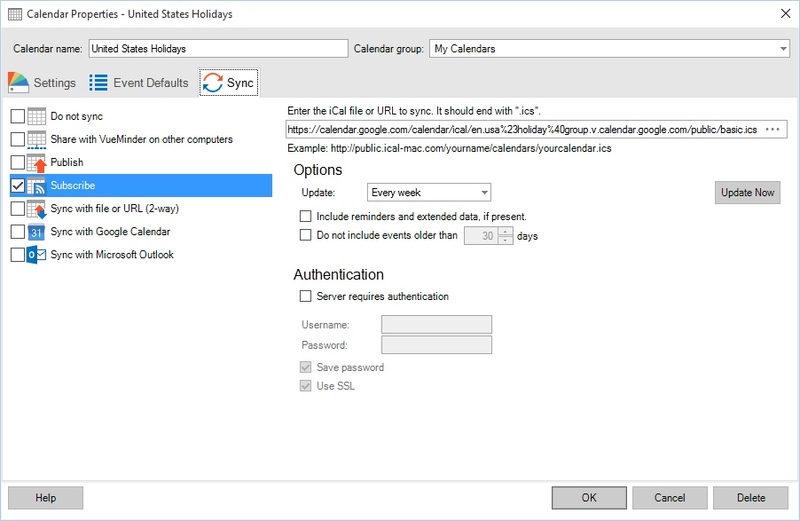 The calendar can be subscribed, published, synced with Google Calendar, synced with Outlook, synced with Exchange Server, or shared over a local network. Depending on the calendar type, the properties window will vary. Calendars associated with tasks or notes will use the Task Calendar Properties or Note Calendar Properties windows, respectively. Tabs are provided for modifying the calendar's appearance, conflict handling, default reminders, and sync settings. If the calendar is a shared calendar and you only have "Reader" access, all tabs except "Settings" will be hidden because only the calendar owner can modify those other settings. Also, the calendar name field will be disabled, since only the calendar owner can rename the calendar. To view or modify a calendar's properties, you can double-click the calendar in the Calendar List or use the Calendar Properties command from the Edit menu. The keyboard shortcut is F2. You can delete the calendar by clicking the Delete button. You'll be prompted to confirm. The calendar can be renamed. This name will appear in the Calendar List. If the calendar is shared and you are not the owner of the calendar, this field will be disabled. The calendar appearance can be modified as described here. The specified appearance will be used when the View menu is set to color events based on assigned calendar. The specified appearance will also be used when the color sidebar specified in the View menu is set to use calendar colors. The calendar appearance can also be modified using the Appearance Toolbar. The appearance settings will be used by all new and existing events belonging to the calendar. Note that if the Appearance Option has been set to allow events to have individual custom appearances, any events that had their appearance customized will not be affected by changes on this screen unless the "Override any custom event appearance settings" box is checked prior to clicking the OK button. 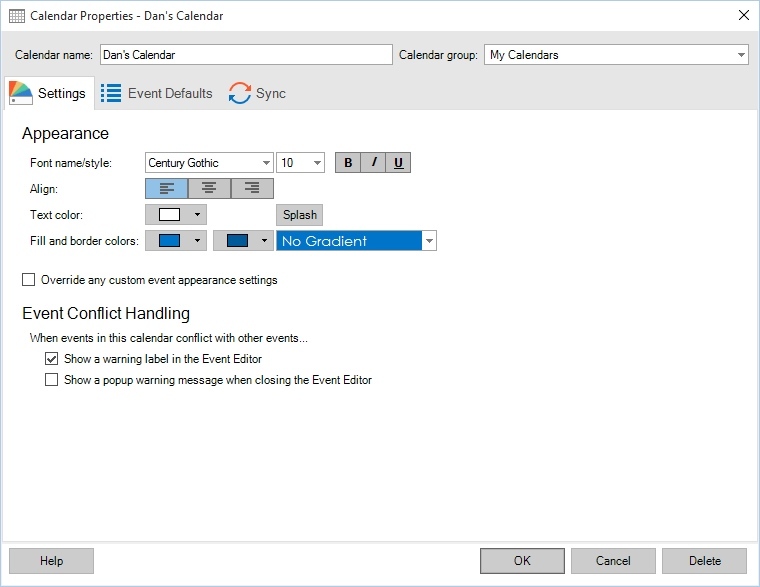 Each calendar can be individually configured for event conflict handling, enabling warnings to be displayed when events within the calendar, or in other calendars that have conflict handling enabled, are scheduled to occur at the same time or overlapping times. Two types of warnings are provided, and can be enabled or disabled using the checkboxes. The "Show a warning label in the Event Editor" check box will result in a warning label in the Event Editor if the event time conflicts with another. An example is shown below. The "Show a popup warning message when closing the Event Editor" check box will result in a more informative message appearing when the Event Editor is closed, if the conflicting event belongs to this calendar. The specific conflicting event(s) will be listed in the message. To completely disable event conflict warnings for an individual calendar, uncheck both boxes. To disable conflict warnings for ALL calendars, repeat this for each calendar. Default event properties can be specified. These will be used when new events belonging to the calendar are created, when events are imported into the calendar, or when the calendar syncs with an external source such as Google Calendar or a calendar subscription. For example, if you have a calendar whose events you'd like to default to sending email reminders 4 hours before the event starting time, you can specify this in the calendar properties. Any new events will automatically default to having this property. Each calendar can have its own event defaults. You can also make the current calendar's settings the defaults for any new calendars by checking the "Use these defaults for new calendars" box. Default event duration - This is the default event length to be used when creating a new event in the Month view only. You can select a length from the list, or type in any length of time, from minutes to months. Events can also default to being all day. This setting isn't used when creating events in the Day and Week views, since the event duration will be based on the time slots that are selected when creation of a new event is commanded. Event start time in Month view - This is the default starting time for events created in the Month view. If Auto is selected, the start time will be based on the current time if the event is being created on today's date. Otherwise it will default to the work day starting time as specified in the Calendar Options. If you prefer to have a default starting time, a value can be selected from the drop-down list. This field will be hidden if the default length value is set to "All day", since all-day events don't have associated starting times. Default recurrence pattern - New events can default to recur with the specified pattern (Daily, Weekly, Monthly, etc.). Default title - This is the default title for new events. Category - This is the default category to be associated with new events belonging to this calendar. For example, if the calendar is intended to be used for birthdays, you could set the default category to "Birthday". Categories can be selected by clicking the drop-down button, or new categories defined using the "..." button. One or more categories can be selected. If you don't want a default category, uncheck all the boxes in the drop-down list. Priority - This is the default priority to be assigned to new events belonging to this calendar. The priority can be selected from the drop-down list, or a new priority defined by clicking the "..." button. Location - This is the default event location. A location can be typed in using the keyboard, or a previously used location selected from the drop-down list. The "..." button will display the Location Editor, where locations can be created, deleted, or renamed. Calendars can be configured to sync (or not) via the Sync tab. 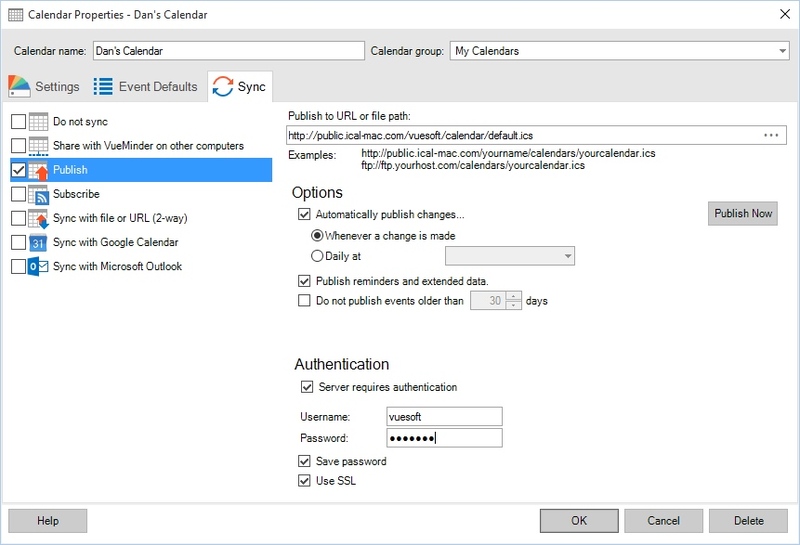 VueMinder can share calendars with other VueMinder installations on your local network, publish calendars, subscribe to calendars, sync 2-way with an iCalendar file/URL, or sync calendars with Google Calendar, Outlook, or Exchange Server. Check the "Do not sync" box on the Sync tab of the Calendar Properties if you don't want your calendar to sync with any external calendars. Your calendar will be stored locally and will be completely private. Calendars can be shared over a local network, enabling the same calendar to be viewed or modified by multiple people, or from multiple computers. Calendars are shared through MySQL Server. Installation instructions can be found here. To share a calendar over the local network, check the "Share this calendar" box on the Sync tab. If this is the first time you've shared a calendar, you may be asked to specify the server name. All computers sharing calendar data must be configured to use the same server. The server can be specified in the Sharing Options. After sharing a calendar, it will automatically appear on other computers. The calendar will default to being read-only for all people on the network. You can assign a different default permission for the "(Everyone)" identifier, or you can selectively assign user permissions to override the default. 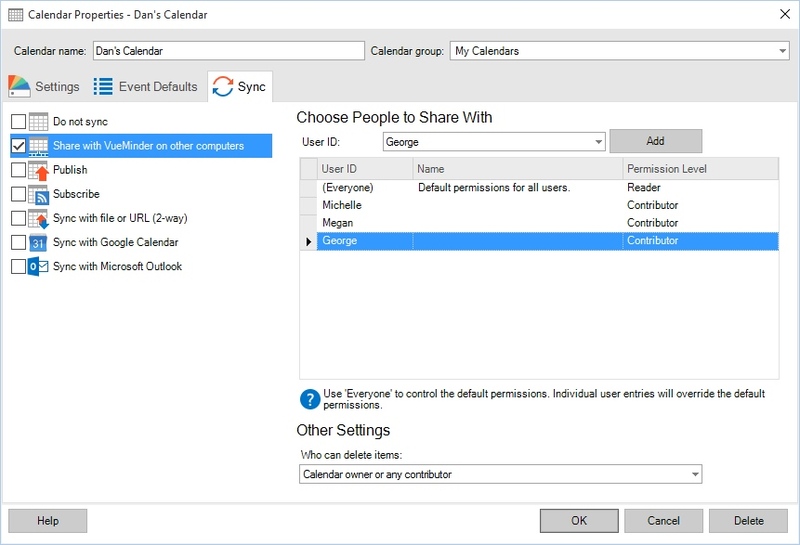 In the example above, three additional users were added with "Contributor" permission, meaning they can both view and modify the calendar. All other users can only view it. Permission levels are stored securely in the shared database, using 256-bit encryption. This ensures the data is secure from unauthorized users. Contributor - The user can add, remove, or modify events belonging to the calendar. Event colors and reminders can be changed and shared with other users. The user can also change the calendar's defaults for new events. Reader - The user can view events and add personal reminders, but those reminders are not shared with other users. The user can also change event colors, but changes are only on the local computer. Any other changes, such as modifying or deleting an event, will not be allowed. Permissions can also be defined for who can delete events in the shared calendar. By default, the calendar owner and any contributor can delete events. You can change this so only the calendar owner, or only the calendar owner and the person that created a particular event, can delete that event. Calendars are published using the Standard iCalendar (RFC 5545) Format. To enable publishing of a calendar, check the "Publish" box on the Sync tab. A location to publish the calendar needs to be specified. This can be a web URL or a shared file on your local network. The name should end with ".ics", which is the file extension for iCalendar file types. When publishing to a shared or local file, you can use the "..." button to browse to the desired destination. Otherwise, the web URL will need to be typed or copied/pasted from your web browser. Automatically publish changes - The calendar will be automatically published. You can choose to publish whenever a change is made, such as an event being added, removed, or modified. Or you can choose to publish automatically at a certain time of day. If VueMinder is not running when the time of day is reached, the calendar will be published the next time VueMinder runs. Publish reminders and extended data - The calendar will be published including reminder settings, event appearances, completion status, and other data extensions that VueMinder adds to the iCalendar format. These extenstions are not part of the standard iCalendar format and will be ignored by other programs. Do not publish events older than - You can decrease the size of the exported file, as well as the amount of time required to generate it, by excluding events older than a specified number of days. You can also use the Publish Now button to immediately publish the calendar. Note that this is the same as commanding Sync Calendar from the Share menu or Status Bar. WWhen publishing to a web URL that requires authentication, you'll need to check the "Server requires authentication" box. Enter your username. You can optionally enter your password and check the "Save password" box. If you choose to not save your password, you will need to manually enter your password when the calendar is published. Passwords are saved securely to the local drive using 256-bit encryption. VueMinder can also connect securely using the SSL (Secure Socket Layer) 3.0 or TLS (Transport Layer Security) 1.0 protocols, when available. You can subscribe to any calendar file that follows the Standard iCalendar (RFC 5545) Format. To subscribe to a calendar, check the Subscribe box on the Sync tab. A URL or file location must be specified. The Add Public Calendars and Holidays feature can be used to add calendar subscriptions without needing to enter a URL. Calendars that are subscribed to external sources will be read-only in VueMinder, to ensure local changes aren't made which will be overwritten the next time the calendar subscription syncs to match the remote calendar. If you want to edit a subscribed calendar, you can uncheck the "Subscribe" box on the Sync tab. However, the calendar will no longer sync to match the external calendar. A location of the calendar you wish to subscribe to needs to be specified. This can be a web URL or a shared calendar file on your local network. The name should end with ".ics", which is the common file extension for iCalendar file types.. When subscribing to a shared or local file, you can use the "..." button to browse to the desired destination. Otherwise, the web URL will need to be typed or copied/pasted from your web browser. In the example shown above, the subscription is to a public Google calendar. Update-- The calendar subscription can be set to manually update, or automatically update at the specified frequency, which can range between 1 minute and 1 week. Include reminders and extended data - The calendar subscription will include reminder settings, if compatible with VueMinder. It will also include event appearances, completion status, and other data extensions that VueMinder adds to the iCalendar format. These extensions will most likely be present only when subscribing to a file that was published using VueMinder. Do not include events older than - You can exclude old events from the subscription. This will decrease the amount of processing required when the calendar subscription is synced. You can use the Update Now button to immediately update the calendar subscription. Note that this is the same as commanding Sync Calendar from the Share menu or Status Bar. When subscribing to a web URL that requires authentication, you'll need to check the "Server requires authentication" box. Enter your username. You can optionally enter your password and check the "Save password" box. If you choose to not save your password, you will need to manually enter your password whenever the calendar subscription is updated. Passwords are saved securely to the local drive using 256-bit encryption. VueMinder also connects securely using the SSL (Secure Socket Layer) 3.0 or TLS (Transport Layer Security) 1.0 protocols, when available. 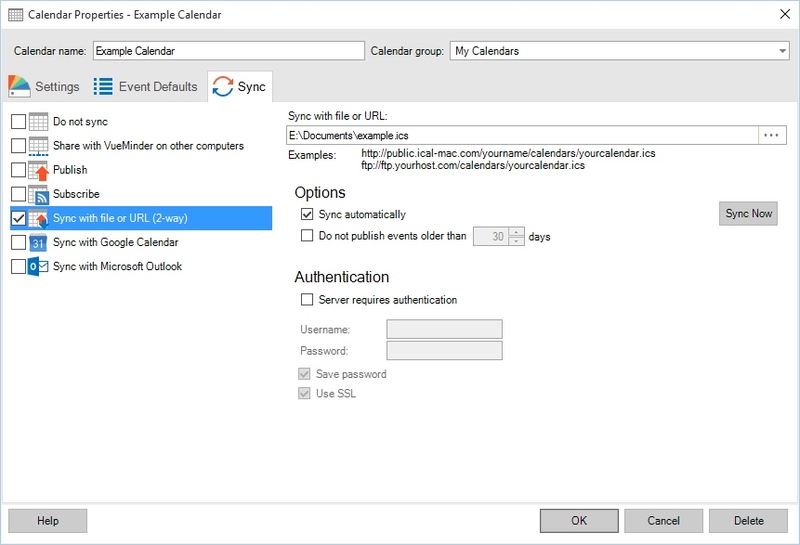 Calendars can be configured to sync 2-way with an ics (iCalendar) file or URL. This is equivalent to both publishing and subscribing to the same location. It's a simple alternative to the Share with VueMinder on other computers feature. However, due to how files are locked by Windows while being modified, this feature is not recommended when multiple people could be actively editing the same calendar at the same time from different computers. Sync automatically - The calendar will be automatically synced whenever changes are made on the local computer or on a different computer that syncs with the same ics file. Do not publish events older than - You can decrease the size of the synced file, as well as the amount of time required to process it, by excluding events older than a specified number of days. You can also use the Sync Now button to immediately sync the calendar. Note that this is the same as commanding Sync Calendar from the Share menu or Status Bar. When syncing with a URL that requires authentication, you'll need to check the "Server requires authentication" box. Enter your username. You can optionally enter your password and check the "Save password" box. If you choose to not save your password, you will need to manually enter your password when the calendar is published. Passwords are saved securely to the local drive using 256-bit encryption. VueMinder can also connect securely using the SSL (Secure Socket Layer) 3.0 or TLS (Transport Layer Security) 1.0 protocols, when available. VueMinder can sync with Google Calendar. Since most smartphones and mobile devices can also sync with Google Calendar, this feature provides an easy method of keeping VueMinder in sync with your devices. To sync a calendar with Google Calendar, check the "Sync with Google Calendar" box on the Sync tab. The calendar will be uploaded to your Google account and added to your calendar list. If you use multiple Google accounts and you haven't previously sync'd VueMinder with Google Calendar, make sure you're logged into the desired Google account in your web browser prior to enabling syncing. If you already have existing Google calendars you'd like to add to VueMinder, use Add Google Calendar command on the File menu instead of enabling syncing through the Calendar Properties. Otherwise, you'll end up adding a new calendar to your Google account rather than configuring VueMinder to sync with an existing calendar in your Google account. Note: You may need to refresh the Google Calendar web page, if it was already open prior to enabling syncing. Two options are provided for the sync direction. Choose whichever option will best match the way you intend to modify your calendar. For example, if you need to modify the calendar from both VueMinder and Google Calendar, the "2-way" setting would be the best choice. Or, if you're just using Google Calendar to see your events, but intend to make all modifications from within VueMinder, the "1-way VueMinder to Google Calendar" setting would be best. In most cases, the "2-way" option is recommended. When this box is checked, the calendar will sync automatically, within 20 seconds of any changes made in VueMinder or Google Calendar. Syncing can also be manually commanded using the Sync Calendar command on the Share menu or Status Bar. When this box is checked, calendar and event colors will sync between VueMinder and Google Calendar. When this box is checked, VueMinder will show popup reminders for events that have been defined in Google Calendar to show popup reminders, and vice versa. This option is not used for email and SMS reminders, since that would result in duplicate reminders being transmitted from both VueMinder and Google Calendar. When this box is checked, the default event settings specified on the Event Defaults tab will be applied to new events that are added to VueMinder as a result of syncing with Google Calendar. In other words, if you add events to Google Calendar, you can use this option to automatically configure those events to show reminders in VueMinder. VueMinder can sync calendars with local Microsoft Outlook calendars, which can then synchronize with many mobile devices, such as iPhone, Android, and Blackberry. Outlook can also sync with Yahoo Calendar and Windows Live Calendar. Note: If you have an existing calendar in Outlook you'd like to synchronize with VueMinder, the easiest approach would be click the Add Outlook Calendar command on the File menu.. Only calendars that are stored in the local Outlook .pst file will be available to sync. If you sync Outlook with calendars located on an Exchange Server, you can configure VueMinder to sync with your Exchange Server calendars by using the Add Exchange Calendar command on the File menu. Outlook synchronization requires Microsoft Outlook 2010 or later. It is not compatible with Outlook Express. The calendar name in Outlook and VueMinder must match in order for syncing to work properly. If you rename the calendar, make sure to rename it in both VueMinder and Outlook. 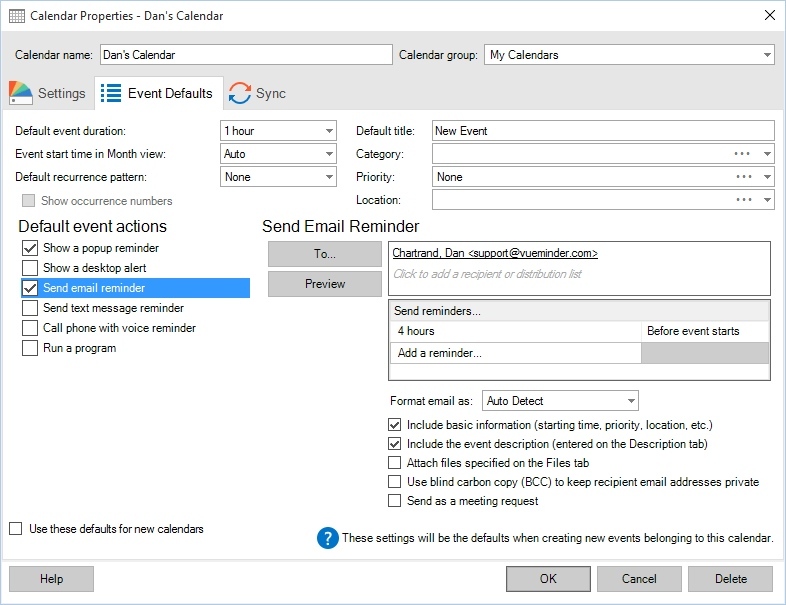 If synchronization is enabled, VueMinder will automatically sync the calendar with a calendar of the same name in Outlook, at the specified interval. When the sync direction is set to 2-way, changes made in Outlook will sync to VueMinder and vice versa. Otherwise, changes made in Outlook will not appear in VueMinder. Make sure you pick the correct sync direction for your needs. You can disable automatic syncing by selecting "Never" from the drop-down list. Syncing will only occur when manually commanded via the Share menu. You can also chose to immediately synchronize by clicking the "Sync Now" button. If you'd like to decrease the time required to synchronize calendars with Outlook, you can choose to exclude events older than a specified number of days from being synchronized. IIf a reminder has been dismissed in Outlook (or on a mobile device that syncs with Outlook), the reminder will also be automatically dismissed within VueMinder the next time the automatic Outlook sync occurs if the "Include reminders" box is checked. The date and time of the most recent synchronization will be displayed. Due to limitations of Outlook, many of the advanced reminder and appearance settings of VueMinder will not be available when viewing the calendar from within Outlook. NNote: If the Trust Center in Outlook doesn't recognize your antivirus software or if your virus definition files are out-of-date, you might recieve a warning message when VueMinder syncs with Outlook. The message will claim another program is attempting to access your email. This is not true - VueMinder only accesses the calendar data in Outlook, nothing else. To disable the warning message, update your antivirus definition files or install antivirus software that is compatible with Outlook. If that's not an option, you change the sync frequency to "Never" and manually sync when needed. The Outlook message will still appear, but only when you command syncing. Microsoft Exchange calendars can be added to VueMinder by using the "Add Calendar -> Add Exchange Calendar" command on the FIle menu. After an Exchange calendar has been added, its sync settings can be modified via the Sync tab of the Calendar Properties. The "Sync with Microsoft Exchange" option doesn't appear for calendars that haven't been added from Exchange Server. The sync direction can be set to 2-way or 1-way (Exchange to VueMinder). If you sync your mobile devices with Exchange ActiveSync, the 2-way option is recommended. This will result in changes you make in VueMinder appearing on your mobile devices, and vice versa. 2-way syncing also enables seamless integration with Outlook when syncing through the same Exchange Server. VueMinder can also sync with contact data that is found in meeting requests. Uncheck the "Include contact data" box if you don't want contact information to be synced. In some cases, this can help improve performance when syncing since less data is transmitted.